Joe Humphreys has demonstrated his passion for angling, water, and wildlife throughout his life and career as a fly fisherman. Fortunately for us, Mr. Humphreys enjoys sharing his knowledge and skills, doing so through his works as an educator, author, and conservationist. He has authored two highly acclaimed books, Joe Humphreys Trout Tactics and On the Trout Stream with Joe Humphreys, and many articles in regional and national periodicals. 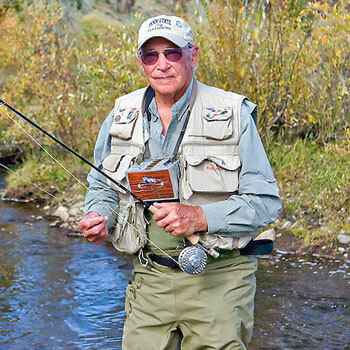 Joe Humphreys has taught fly fishing for over forty years and still loves to share his insights. Nymphing is one of his favorite approaches; he shares a lifetime's worth of experience on this as well as fishing brush and night fishing on this show. He has also hosted a nationally broadcasted fly fishing series on ESPN, been featured on three fly fishing videos (The Fly Fishing Series), and produced and been featured on four very well-received videos. Joe Humphreys has taught fly fishing for more than forty years, including directing Penn State's angling program for nineteen years. Some high-profile pupils include former President Jimmy Carter, former Vice President Richard Cheney, and basketball coach Bobby Knight. He currently teaches a weekend fly fishing course at the impressive Yellow Breeches Creek at Boiling Springs, Pennsylvania, hosted by Allenberry Resort located directly on the creek. To learn more about Joe's classes, books and videos visit Joe Humphreys Fly Fishing.